Attendance at healthcare trade shows is on the rise. While other industries have experienced a decline in attendance over the last 10 years, the healthcare industry is seeing growth. Whether you hope to build brand awareness, acquire leads or educate at your next exhibit, this article is for you. It offers several tips for success at the trade show as well as healthcare trade show giveaway ideas. Choose the right show: Maybe you already know which show you plan on attending, but if you don’t, you’ll want to conduct some research. Consult with industry and trade show associations, and check to see what competitors are doing. Define your goals to help choose the right show for your organization. Promote your presence prior to the big day: Once you’ve chosen your show, it’s time to plan how you’ll promote your presence. Prior to the show, let attendees know you’ll be there by sending email blasts, posting on your website and sharing on social media. Send attendees a USB drive loaded with info about your exhibit. Include sneak peeks of product demos, new services or other exciting information. And ensure they visit your booth by hanging on to the coordinating USB cap—attendees can grab that when they stop by to see you. Engage visitors: Having exceptional booth staffers is a must. Make sure your representatives are welcoming, engaging and equipped to answer any and all questions. In addition to choosing the right staff, you must employ engagement strategies. Will you offer presentations? Fun games that aim to educate and entertain? Some sort of virtual or augmented reality experience? Or the opportunity to interact with (or even purchase) a new product or service? Offering some sort of convenience or amenity is another way to drive traffic. For instance, does your booth double as a charging station? Can visitors get a free chair massage? Or do you offer refreshments? If so, don’t miss out on branding opportunities. Align your medical trade show giveaways with your booth amenities—for example, a media charging station, body lotion or tumbler with straw makes an excellent choice. For healthcare-themed giveaways, consider Pocket Spray Sanitizer, first-aid kits or Cold & Flu Pocket Sliders. Make your healthcare trade show giveaways count: The best giveaways provide value to their recipient. 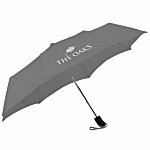 In fact, 85 percent of people will hang on to a promotional product if it is useful. Some options that are both popular and functional include power banks, tote bags and drinkware. Choose a multifunction power bank for maximum utility. This power bank provides four features in one: a power bank, screen cleaner, pen and stylus. 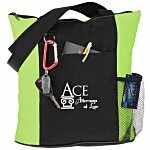 This tote bag has multiple compartments to hold everything they’ll need the day of the show or at the office. If you’re looking for drinkware they’ll use every day, choose a sport bottle with a flavor infuser. Follow up: Last but not least, follow up with any leads you met at the show. Best practice is to touch base within five days. Call, email, drop a note in the mail or, if time and proximity permit, stop in. If the person you wish to see isn’t there, leave behind a pack of sticky notes with a note indicating you stopped in and would love to chat. We hope these tips help you succeed at your next trade show. Remember: choose the right event, promote your presence, engage visitors, come with the right healthcare trade show giveaways and follow up post-show. Good luck!